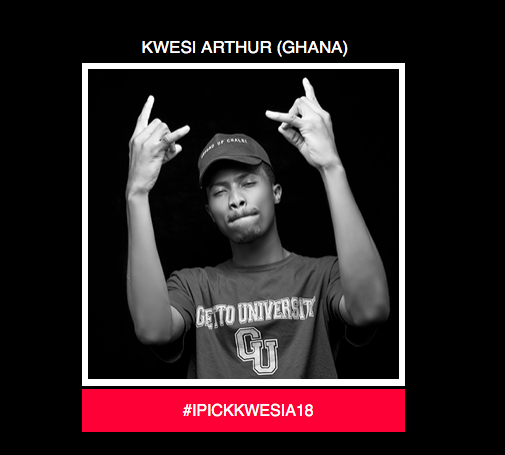 BET Awards nominated Ghana’s Kwesi Arthur for Viewersʼ Choice: Best New International Act nomination. Recently, Kwesi Arthur won the Hip-Pop Song Of The Year in the 2018 Vodafone Ghana Music Awards. Furthermore, he won the award with his hit song ‘Grind Day’. He defeated likes of Teephlow, Sarkodie, Kojo Cue and B4bonah. Moreover, apart from Arthur, there are artists from France, Brazil, Nigeria, South Africa and more. However, if he wins the award he would join Stonebwoy and Sarkodie as the only Ghanaian artists to have ever won a BET award. 2018 Bet Awards nominations were announced in 20 categories. The BET Voting Academy selected the nominees. The Academy comprises of a group of respected entertainment professionals in the fields of television, film, music, social media, digital marketing, sports journalism, public relations, creative arts and fans.